The term textile can mean many things to different people and across museum collections. 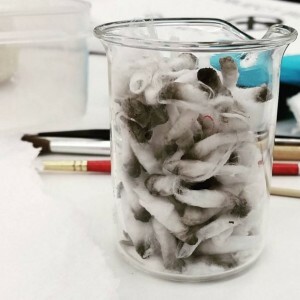 The requirement of a “textile” conservator to work on items which are not textiles in the traditional sense can vary depending on institution collection, institution staffing or personal specialism. As we head down the home straight of second year we are presented with objects which require a little more thought and a bit more cross-disciplinary research. 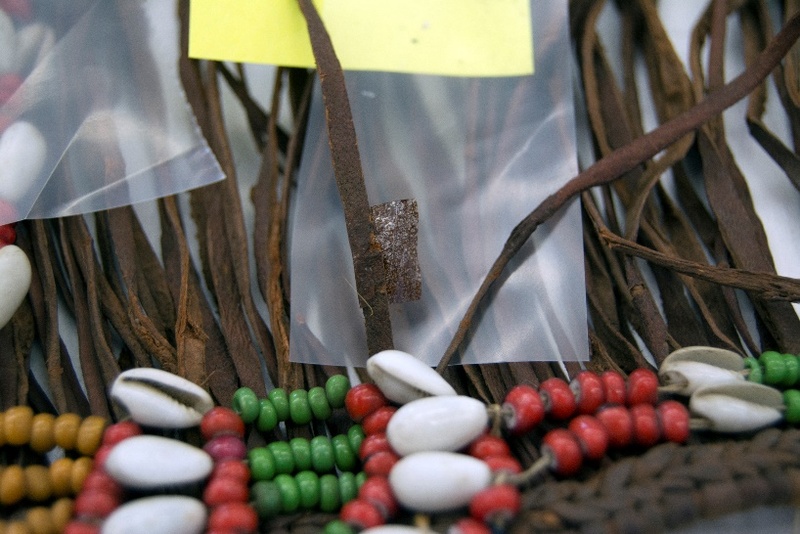 Leather can often crop up amongst western textile objects in the form of shoes or accessories. For me though working on a leather object meant moving completely into the unknown to treat a Sudanese leather dress belonging to Glasgow Museums and accessioned into the collection in 1904. Figure 1: Dress (1904.14.cj.duplicate.1) before treatment. © CSG CIC Glasgow Museums Collection and University of Glasgow, 2016. Lovingly referred to as the “birds nest” during my initial observations, this dress was the complete opposite of any dresses I was familiar with previously. 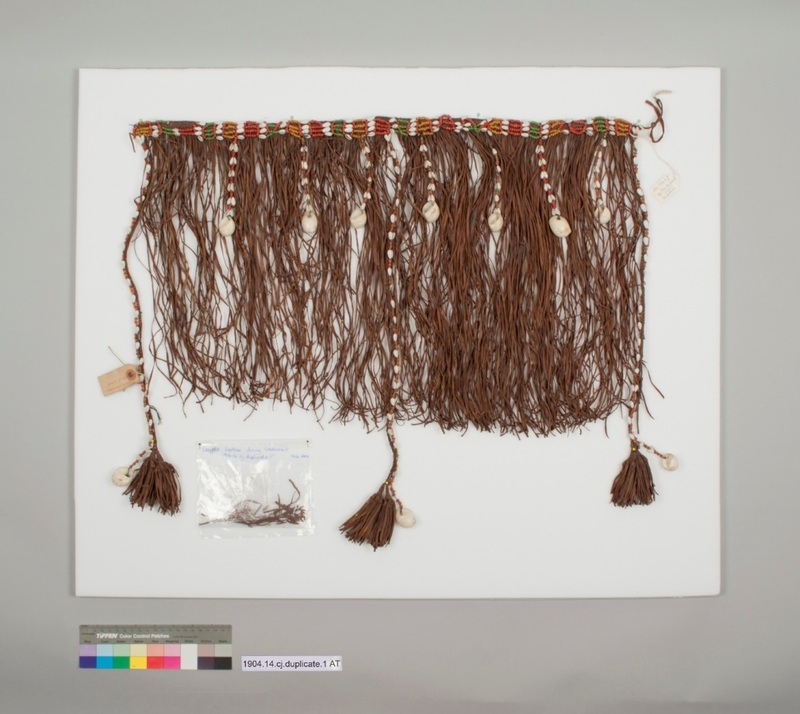 The dress is made of many leather strands knotted onto a single horizontal strand; plaited cords, leather tassels, shells and beads form the decoration. When it came into the studio the dress was folded in half which had allowed the leather strands to tangle together. There was also some dust present on the beads and shells. The two key aspects to my brief for the treatment of the dress were to clean it and store it. In order to clean all elements the dress first had to be opened out flat. Those who are avid readers of the CTC blog may remember Kate Clive-Powell’s blog from last year, where she had to unfold a large gut-skin parka. I had to do the same, albeit on a smaller scale. Increasing the humidity (moisture content) of the air directly around the dress allowed some moisture to enter the leather making it temporarily more flexible and therefore less likely to break during untangling. In order to carry out the untangling safely I continued to work in the humidification chamber, stopping every now and again to allow the humidity to stabilize when it become too low. Figure 2: Thinking inside the box – tweezers, glass weights and a lot of concentration helped in the 5 hours detangling process. © CSG CIC Glasgow Museums Collection and University of Glasgow, 2016. The decision for a conservator to clean something is not one which is ever taken lightly. It is impossible to replace soiling back onto an object once it has been removed, therefore time is often taken to study the nature of the soiling or staining to ensure it does not add to the biography of the object – can the dirt tell us something? For example, splashes of paint onto an artist’s smock got there accidentally, but they could give information regarding paint pigments and binders. In this case the dust looked..well…very dusty! Therefore cleaning was considered a good option as it helps to brighten up the appearance of the decoration and ensures the particulates in the dust don’t do any damage to the threads joining the beads. 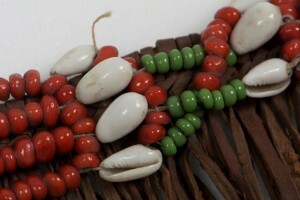 The beads were cleaned with lightly dampened cotton swabs. These lift dirt without over-cleaning. 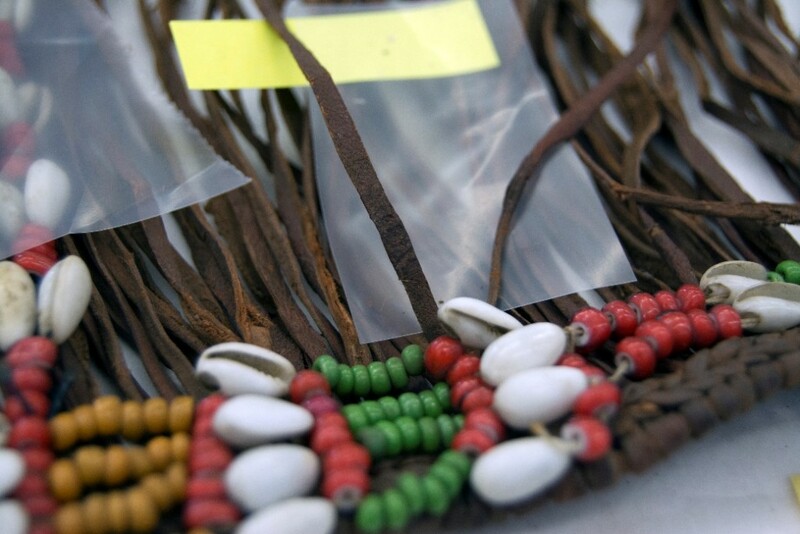 Figure 3: Detail of beads before treatment. © CSG CIC Glasgow Museums Collection and University of Glasgow, 2016. 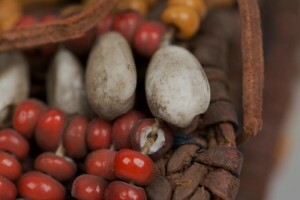 Figure 4: Detail of beads after treatment. ©CSG CIC Glasgow Museums Collection and University of Glasgow, 2016. Figure 5: Eleven hours of swabbing later…. © CSG CIC Glasgow Museums Collection and University of Glasgow, 2016. 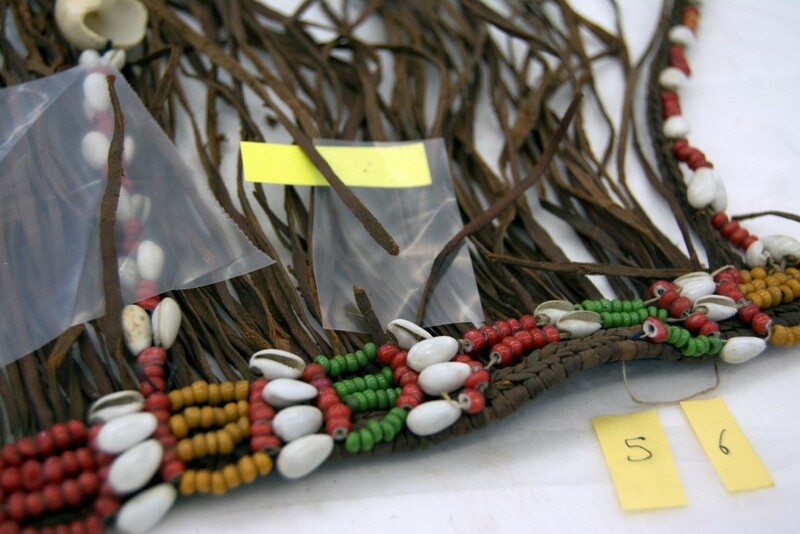 During the untangling process several strands of leather were found broken off, just being held in place by the tangles. These were reattached using spider tissue coloured with acrylic paint and adhered in place using a conservation grade adhesive (Lascaux 498 HV, a water soluble thermoplastic acrylic adhesive). The joins are colour matched to the front of the leather, but not to the lighter back. This makes them easy to spot should someone in the future want to reverse the treatment. Figures 6-8: Joining the broken ends with spider tissue. Adhesive on the tissue is activated using finger pressure and heat. © CSG CIC Glasgow Museums Collection and University of Glasgow, 2016. 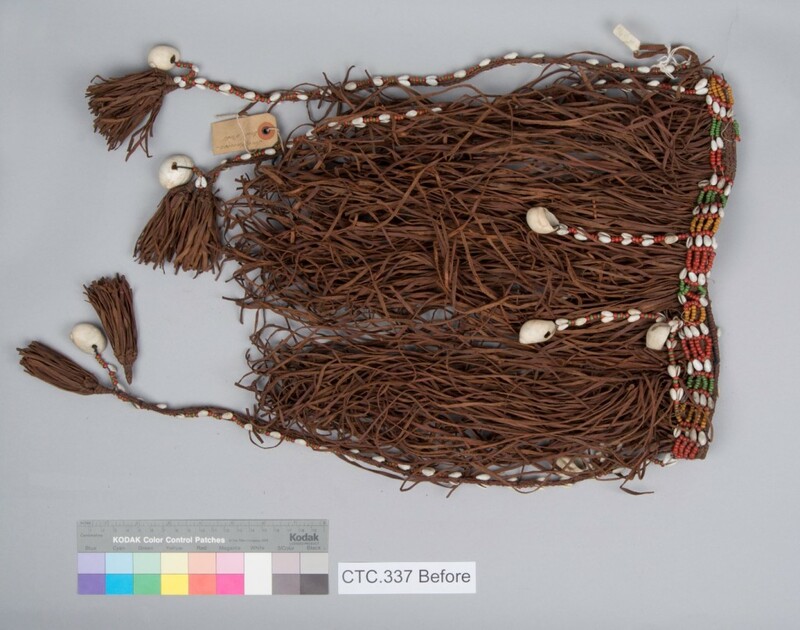 The dress, on its new board, is now much easier for researchers to access and study. The necessity to research unfamiliar materials is something that will continue crop up throughout my career so it was quite good to get a little head start on leather! Fig. 9 The dress after treatment © CSG CIC Glasgow Museums Collection and University of Glasgow, 2016.